It has become a part of who I am, not just something that happened to me. 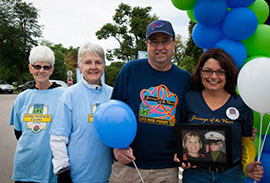 Amy and her husband Jerry at the Unyts Donate Life Walk with dear family friend Annie Keller and Amy’s mom, Diane Weimer. 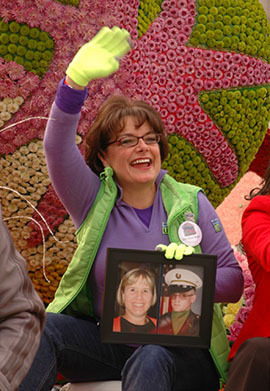 Amy and her family participated in the 2013 Donate Life Rose Parade Float. Clarence, New York — Amy Nash was diagnosed with end-stage renal disease during her senior year in college. In the mid-1980s, living donation outside of immediate family members was very rarely done. Her family was tested, but while they all matched one another, no one matched Amy’s O+ blood type, so she was placed on the organ transplant waiting list. Four months after beginning peritoneal dialysis, 23-year-old Amy received her first kidney transplant in 1986 from a 20-year-old man who died in a car accident. After 21 years, Amy’s renal function fell below 20 percent, so she returned to peritoneal dialysis and was again placed on the transplant waiting list. This time, Amy was on the list for 60 months. A dozen friends were tested as potential donors, and one dating back to childhood, Maureen Wirth, proved to be a match. In December 2008, Amy received her second kidney transplant; eleven months later, Maureen ran the New York City Marathon. Today Amy volunteers with Unyts as a way to thank her two kidney donors. She loves to use her marketing and public speaking background to put a face on organ transplantation and kidney disease to educate others. 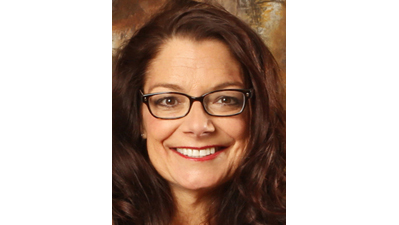 Amy speaks as often as possible to present at schools, corporations, religious groups, civic organizations, and media. 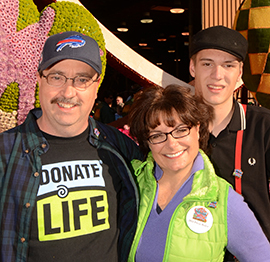 In celebration of her two transplants, Amy raised over $20,000 for the National Kidney Foundation of Western New York to help patients like herself. NKF honored her with an Extraordinary Achievement Award in 2007. In 2008, Amy was thrilled to be invited to Washington, D.C., to speak with Congressional staffers in an effort to ensure passage of the 2008 Medicare Health Act, one of the last bills Ted Kennedy championed and voted for. Amy was able to do dialysis between meetings in Congressional offices, and her advocacy on Capitol Hill remains one of her proudest achievements.